To send out a message to multiple users or groups from your list, follow these steps. 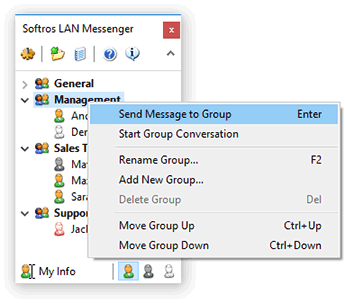 Right-click the name of the group you would like to send the message to, and then click Send Message to Group. Right-click any user name in the list, and then click Send Broadcast Message. 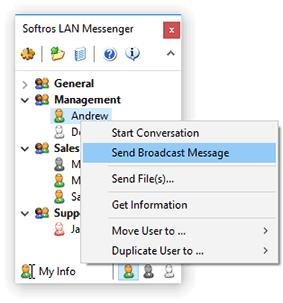 In the Send Broadcast Message window, make sure the list of recipients of the broadcast message is complete and, if not, add more users or groups to it by checking the check boxes next to their names. Everyone – all users in the list. Online – only online users. Offline – only offline users. To cancel your selection, click No one. 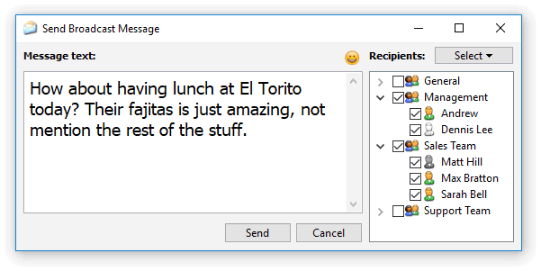 To enter a message consisting of multiple lines, press CTRL+ENTER each time you need to start a new line. The keyboard shortcuts mentioned above are set by default and can be modified on the Hot Key tab in the Settings dialog box.